GAZIPUR: Alhaj Adv Md Jahangir Alam, Mayor, Gazipur City Corporation speaking at a discussion meeting on the occasion of the 20th foundation anniversary of Sheikh Mujibur Rahman Agriculture University yesterday . Dr Md Gias Uddin Miah, VC of the University presided over the programme. Two including a jail guard arrested with YabaRU CorrespondentDetectives arrested two including a prison guard and seized 200 pieces of yaba from Rajshahi Medical College Hospital's gate area recently. 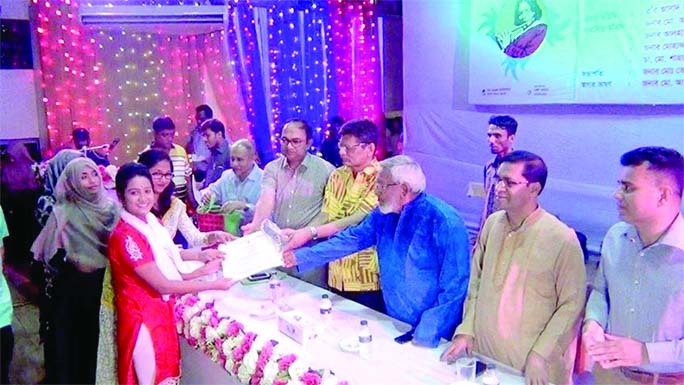 MOULVIBAZAR: The certificate distributing programme of five day-long training workshop was held at Moulvibazar jointly organised by Jatiya Kobi Kazi Nazrul Islam Institute and Cultural Affairs Ministry recently. 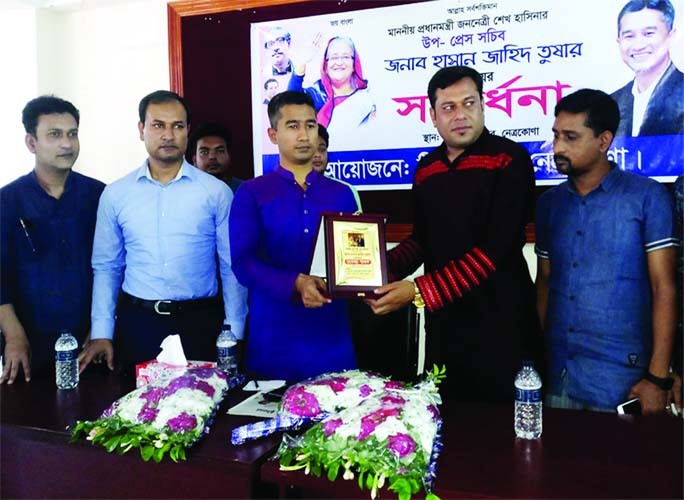 NETRAKONA: Hasan Jahid Tushar, Deputy Press Secretary of Prime Minister receiving a crest from Azharul Islam Arun, Chief Coordinator of Amra Nouka Team, Netrakona District Unit at Netrakona Press Club on Saturday. MYMENSINGH: US Ambassador to Bangladesh Earl R. Miller called on Pro- Vice Chancellor of Bangladesh Agriculture University(BAU) Prof Dr. Md. Jashimuddin Khan, faculty members and officials of BAU at Pro -Vice Chancellor office during his visit at BAU on Tuesday. 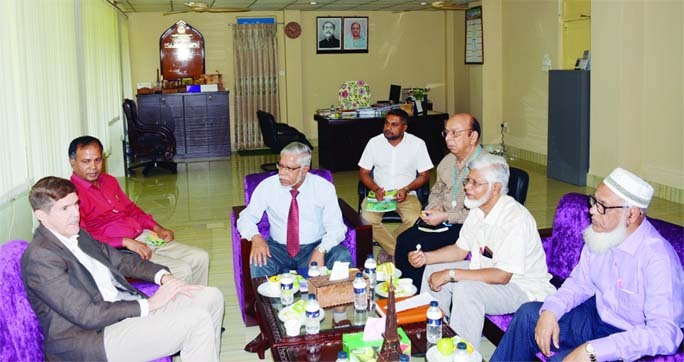 Staff Reporter, Mymensingh :US Ambassador to Bangladesh Earl R. Miller visited Bangladesh Agricultural University (BAU) in Mymensingh on Tuesday. He called on Pro-Vice Chancellor of BAU Prof Dr. Md. 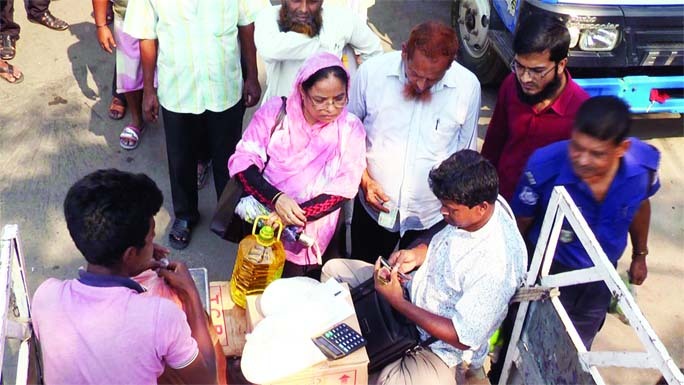 RANGPUR: Mostafizur Rahman Mostafa, Mayor , Rangpur City Corporation inaugurating selling of essential commodities of Trading Corporation of Bangladesh(TCB)at a function held on City Bhaban premises as Chief Guest on Tuesday afternoon.